Seriously. When Mazda was developing what would become the best-selling sports car in history, the proposals included the rear-wheel drive roadster we all know and love (above and below right), a mid-engine MR2 knock off (below middle), and a front-wheel drive disaster (below left). 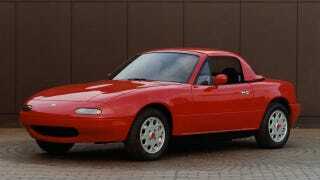 Mazda made the right call, and the answer has been "Miata" for the past 25 years. Catch up on the full story at Road & Track.